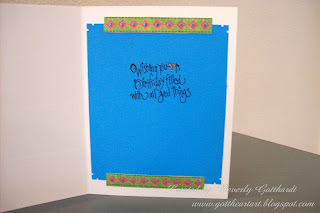 This week I'm just happy to get one card made at a time. I think I've pondered here before, who does all the general living stuff for full time artists? They must have some special people who allow them to practice their art. 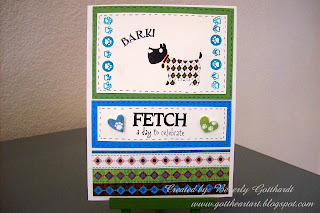 Supplies: Card Blank Ivory 61/2" X 5" Value Pack Hobby Lobby, Stampin Up-Very Vanilla card stock, designer paper:DCWV-The Pets Stack, Stampin Up:Sizzix texture plate-Harlequin, Ink: Ranger Archival Ink-Jet Black, CTMH Ink: Z2136 Ocean, Stamps: Cloud 9 Design: Dog, Inkadinkado-97620 Dogs, Hero Arts-CL139 Birthday Messages, PrintWorks-Q002 Great Birthday, Marvy-Corner Punch, Markers: Marvy-crimson lake, vermilion, CTMH-creme brulee, Sakura Gelly Roll Pen-Clear Star, pop dots. This is just TOO cute! I love it. What a fun fun card. Thanks so much for playing along!